As we've learned previously, the atom is the smallest part of an element (such as oxygen) that has the characteristics of the element. Atoms are made up of very small negatively charged electrons surrounding, surrounding the much larger nucleus. The nucleus is composed of positively charged protons and neutral neutrons. The positively charged protons exert a repelling electrical force upon each other, but the strong nuclear force holds the protons and neutrons together in the nucleus. This completely summarized our understanding of atomic structure until the 1930s, when scientists began to discover evidence that there was more to the picture, and that protons and nucleons were made up of even smaller particles. This launched the particle physics movement, which, to this day, continues to challenge our understanding of the entire universe by exploring the structure of the atom. In addition to matter we're familiar with, researchers have discovered the existence of antimatter. Antimatter is matter made up of particles with the same mass as regular matter particles, but opposite charges and other characteristics. An antiproton is a particle with the same mass as a proton, but a negative (opposite) charge. A positron has the same mass as an electron, but a positive charge. An antineutron has the same mass as a neutron, but has other characteristics opposite that of the neutron. When a matter particle and its corresponding antimatter particle meet, the particles may combine to annihilate each other, resulting in the complete conversion of both particles into energy consistent with the mass-energy equivalence equation: E=mc2. Understanding these forces remains a topic of scientific research, with current work exploring the possibility that forces are actually conveyed by an exchange of force-carrying particles such as photons, bosons, gluons, and gravitons. The current model of sub-atomic structure used to understand matter is known as the Standard Model. Development of this model began in the late 1960s, and has continued through today with contributions from many scientists across the world. The Standard Model explains the interactions of the strong (nuclear), electromagnetic, and weak forces, but has yet to account for the gravitational force. The search for the theorized Higgs Boson at Fermilab and CERN is an attempt to better unify and strengthen the Standard Model. Although the Standard Model itself is a very complicated theory, the basic structure of the model is fairly straightforward. According to the model, all matter is divided into two categories, known as hadrons and the much smaller leptons. All of the fundamental forces act on hadrons, which include particles such as protons and neutrons. In contrast, the strong nuclear forces doesn't act on leptons, so only three fundamental forces act on leptons such as electrons, positrons, muons, tau particles and neutrinos. 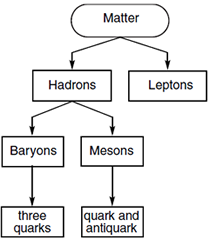 Hadrons are further divided into baryons and mesons. Baryons such as protons and neutrons are composed of three smaller particles known as quarks. Charges of baryons are always whole numbers. Mesons are composed of a quark and an anti-quark (for example, an up quark and an anti-down quark). Scientists have identified six types of quarks. For each of the six types of quarks, there also exists a corresponding anti-quark with an opposite charge. The quarks have rather interesting names: up quark, down quark, charm quark, strange quark, top quark, and bottom quark. Charges on each quark are either one third of an elementary charge, or two third of an elementary charge, positive or negative, and the quarks are symbolized by their first letter. For the associated anti-quark, the symbol is the first letter of the anti-quark's name, with a line over the name. For example, the symbol for the up quark is u. The symbol for the anti-up quark is . Similarly, scientists have identified six types of leptons: the electron, the muon, the tau particle, and the electron neutrino, muon neutrino, and tau neutrino. 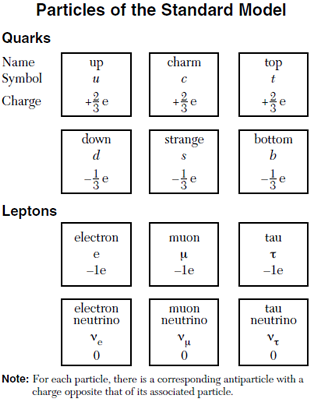 Again, for each of these leptons there also exists an associated anti-lepton. The most familiar lepton, the electron, has a charge of -1e. Its anti-particle, the positive, has a charge of +1e. Question: A neutron is composed of up and down quarks. How many of each type of quark are needed to make a neutron? Answer: The charge on the neutron must sum to zero, and the neutron is a baryon, so it is made up of three quarks. To achieve a total charge of zero, the neutron must be made up of one up quark (+2/3e) and two down quarks (-1/3e). If the charge on a quark (such as the up quark) is +2/3e, the charge of the anti-quark ( ) is -2/3e. The anti-quark is the same type of particle, with the same mass, but with the opposite charge. Question: What is the charge of the down anti-quark ( )? Answer: The down quark's charge is -1/3e, so the anti-down quark's charge must be +1/3e. Learn more about the Standard Model at The Particle Adventure website!